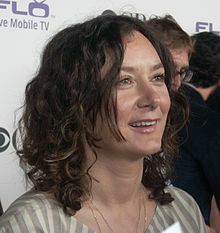 Sara Gilbert quae Leslie Winkle agit anno 2008. Leslie Winkle est persona ficta serie televisifica comoediae rerum status The Big Bang Theory ("Theoria Fragor Maximus"), a Sara Gilbert acta. Novissima mutatio die 13 Maii 2013 hora 20:55 facta.